The global vaccines market size was around $33 billion to $36 billion as of 2018. And, the demand is projected to increment at a positive CAGR of around 8% to 10% during the forecast period of 2019 to 2025. The vaccines industry is expected to continue luring players, particularly in the North-America region, which is the most lucrative region in the global vaccines marketplace in the year 2018, producing around 34% to 36% of the overall demands. This huge demand share is attributed to federal initiatives in North American countries to negotiate the diseases that can be curtailed or overcome via proper vaccines programs. The analyst of the report highlights inactivated vaccines as the most profitable application segment in the vaccines market. 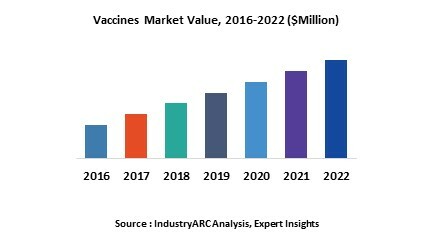 In terms of growth related to inactivated vaccine applications, opportunities in the segment are anticipated to swell at a CAGR of 8% to 9% during the aforesaid forecast period. Inactivated vaccines are known to provide subtle regular doses instead on single high dose. These vaccines are popular for treatment of children. The World Health Organization started an initiative at the end of the previous decade termed Global Vaccine Action Plan 2011-2020. This 10-year framework aims to prevent millions of deaths caused due to unavailability of proper vaccination in communities. The initiative is implying unprecedented efforts by reaching out to remote communities. The venture was responsible for developing a plan that brought together more than 1100 individuals in 140 countries, representing 290 distinct organizations working for immunization. The administration of vaccines is termed as vaccination. Some of the common vaccines in use are prophylactic, toxoid, attenuated, and conjugate. Vaccination is the most operative process to prevent infectious and communicable diseases such as Hepatitis, Influenza, and smallpox caused due to numerous active microorganisms. Preventing child fatalities occurring due to infectious diseases are prominent concern populations and therefore, childhood vaccination programs executed all over the world is one of the most prominent vaccines market growth drivers. The health of a population is the most important asset from an economic perspective as healthy individuals contribute to a healthy economy of a geographical region. Thus vaccination for adolescents and adults is also creating demands for the global vaccines market. According to the WHO, emerging third party and multi-nationals are playing a critical role in immunization. The UNICEF’s vaccine procurement program has teamed up with such companies to supply volumes of doses to remote areas. The most common issue that the vaccine manufacturers and distributors face is the limited access to remote locations. According to WHO, the last remaining strongholds of polio are presumed to result in as many as 200,000 new polio cases annually. Astounding efforts from various governments and global organizations are trying to eradicate polio from across the world. According to a NCBI study, another challenge faced by the vaccine market companies is the research behind developing such vaccines, which is often hindered due to the lack of understanding of immune responses required for specific protection. To overcome this challenge a great density of research and developments are being carried out by various niche companies to achieve innovations in this sector. Some of the other pioneering companies foraying in the vaccines marketplace are Merck &Co., Inc., Emergent BioSolutions, Inc., Johnson and Johnson, Sanofi Pasteur, Inc., Pfizer, Inc., Novartis AG, CSL Ltd., GlaxoSmithKline Plc, Abbott Laboratories, Inc., AstraZeneca Plc, and Janssen Pharmaceuticals, Inc. The base year of the study is 2018, with forecast done up to 2025. The study presents a thorough analysis of the competitive landscape, taking into account the market shares of the leading companies. It also provides information on unit shipments. These provide the key market participants with the necessary business intelligence and help them understand the future of the vaccines market. The assessment includes the forecast, an overview of the competitive structure, the market shares of the competitors, as well as the market trends, market demands, market drivers, market challenges, and product analysis. The market drivers and restraints have been assessed to fathom their impact over the forecast period. This report further identifies the key opportunities for growth while also detailing the key challenges and possible threats. The key areas of focus include the types of vaccines market, and their specific applications in different types of vehicles. 1. Is the market for vaccines growing? How long will it continue to grow and at what rate? 2. Which type of vaccines presents the major growth opportunities? 13. What is our Vision 2030 for Vaccines Market? 14.2. Mitsubishi Tanabe Pharma Corporation. 14.9. Merck & Co. Inc.
Figure7 Merck & Co., Inc.